It’s that time of year where high school teenagers in North America collaborate to come up with creative ideas to one-up each other on their Promposal. We can’t say we aren’t a little jealous of this generation’s creativity, I mean, look at Teen Vogues Best 2017 Promposals and you will see why. Whatever happened to the days when it was as simple as if you were a couple you went to prom together and if you weren’t then you asked a friend or went alone? These days kids are buying gifts, renting out spaces, taking up arts and crafts, enlisting their friends and making a huge AND costly production to ask someone to prom. It’s no wonder parents and teens are feeling the pressure. Are Promposals too much? Out of line? Or just plain fun? We think the idea of Promposals are unique and fun. And let’s be real, it’s up to the kids to make it an elaborate production, a sweet one or costly one. Let kids enjoy their prom and make it what they want! Here are some of our favourite Promposals we had to share with you! prom·pos·al: an elaborately staged request to be someone’s date to a prom. This girl roamed the halls of her school and was able to collect a bouquet and a date for prom. Who can say no to a dog and a fire dance floor?! Give em’ a P, give em’ a R, give em’ a O, give em’ a M! Girl Power! These chicks are sticking together for their big night out! 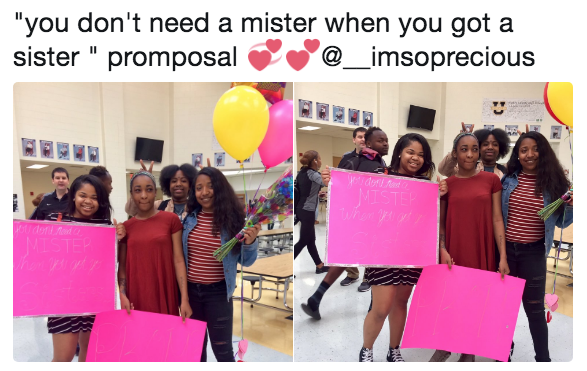 Did your son or daughter surprise someone with a special Promposal this year? Or were they ‘promposed’ to? Let us know in the comments below.